This article was originally featured on Miss604.com as a guest post during Blogathon 2009 on Saturday, July 25. 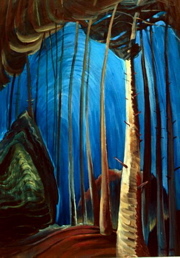 There are few Canadian artists as iconic as Emily Carr. Known around the world for her eerily beautiful expressionist paintings that depict the Canadian West Coast, Emily Carr has become a pressing influence on today’s artists and how we view Canadian art today. Her striking pieces infused with bold colour are so uniquely her own, it’s easy to spot a Carr when you see one. What few people may know about Ms. Carr is that she was actually born on Vancouver Island in 1871, the daughter of English parents and the youngest in her family with eight older siblings. You can still visit the home in which Emily Carr was born, located at 207 Government Street in Victoria (behind the Parliament building). Shunning tradition, Ms. Carr’s passion was her art and her writing, and it was those two mediums that she designed her whole life around. Though partially self-taught and partially encouraged by her father, Emily Carr also devoted a great deal of time to her artistic education. Initially she attended art school in San Francisco, California, but a desire to further her creativity led her to study in Paris and London as well before permanently settling in Canada. With the mention of Ms. Carr’s name, most people will associate her with her vast collection of paintings representing British Columbia landscapes as well as First Nations villages and the abundant forests that call BC home. 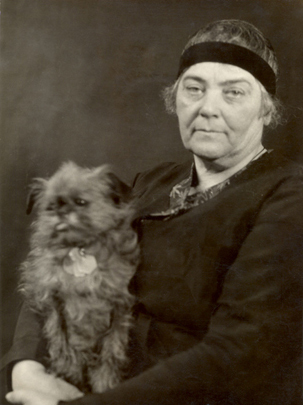 An animal lover, Emily Carr was no stranger to Vancouver Island’s west coast, making frequent trips to Ucluelet – many of her earliest sketches and paintings are of this area. Though her homebase was always Victoria, Ms. Carr also spent a great deal of time in the Queen Charlotte Islands and on Moresby Island. Her last trip up north was in the summer of 1928. Following a stroke in 1939, Emily Carr’s ability to paint was deeply affected, and it was then that her writing became her prominent creative outlet. Ms. Carr’s first book was published in 1941. Her writing was widely well received and she was to receive an honourary doctorate from the University of British Columbia. Sadly Emily Carr passed away in the spring of 1945 shortly prior to this award. In her death, Emily Carr and her incredible work are celebrated and admired. In a time when convention was everything, Ms. Carr carved her own path in life and held on to her independence. She is seen by some as one of the very first pioneers of the women’s liberation movement. As such, Emily Carr has had several Canadian schools and libraries named in her honour, as well as Vancouver’s famous Emily Carr Institute of Art + Design on Granville Island. Today, her work is undoubtedly held in high esteem with most pieces selling for six figures. More recently, an unnamed buyer purchased one of her paintings for a record-shattering $2.16 million! To view more of Emily Carr’s stunning paintings online, please visit Emily Carr At Home and At Work. If you’d like to see Emily Carr’s work with your own eyes, consider a trip to the Vancouver Art Gallery which regularly houses a large number from her collection. At one time I never liked her work but I now appreciate it and actually love it. I can understand that – I’m hugely drawn to symmetry rather than abstract, but her work is so bold, vibrant and full of clean lines. It’s so incredibly unique and I can’t help but be enamoured by her depictions of our home province. Maybe when you’re here in September, we should visit the Vancouver Art Gallery. I LOVE Emily Carr! I especially love it whenever I see it out here because it reminds me of home, totally West Coast, LOVE IT!